Robert G. Smith was given advice early in his career to look beyond the lens and to discover his own unique vision. Whether the image reflects the natural landscape or discarded man-made objects, Smith’s interest is “in shapes and textures and in visual relationships created in nature.” This accomplished photographer/teacher prefers to work in black and white, which is, for him, the ultimate abstract. He counsels his students to follow their hearts to create a work that is honest and unique. Trained at Brooks Institute of Photography, Smith began his career in Los Angeles where he worked on advertising photography with major corporations and creating album covers for the music industry. In 1974 he joined the faculty at Brooks. In his retirement he now has the luxury of capturing what pleases him most, highly abstracted images. His work has been exhibited here and abroad and is in the permanent collection of the Museum of Ventura County. 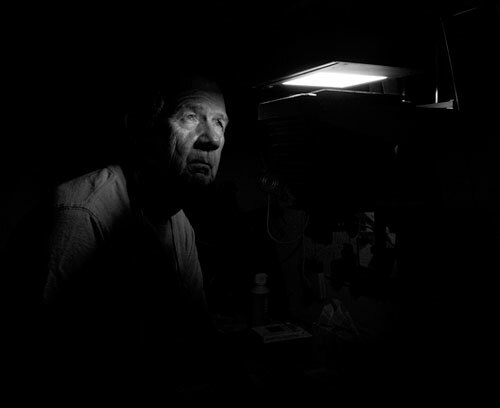 This portrait, taken in his home darkroom, is all about the light. Donna Granata illuminated him with no more than the light from the enlarger head. She captured how the artist not only has a unique vision, but leads the viewer to see the world in a fresh way. Robert G. Smith’s documentation took place in 2008 and was sponsored by Dr. Anthony T. and Barbara Hirsch and Dr. Richard Gould. The FOTM Archive contains extensive information about this artist.